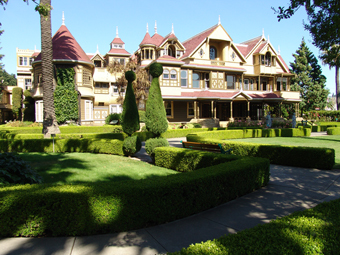 Sitting squat in the center of Silicon Valley, sprawling across nine acres of some of the state’s most desirable commercial and residential real estate, is an immense edifice that’s a monument to those quintessentially Californian traits of nouveau-riche excess, brazen eccentricity, and occult-inspired paranoia––the Winchester Mystery House. This 160-room Victorian behemoth was constructed for one purpose only––to house an army of ghosts. wife of Connecticut firearms magnate William Wirt Winchester. Wealthy, attractive, and talented, Sarah was one of the bright lights of New Haven society, until both her husband and her only child went to early graves. Half-crazed with grief, Sarah sought comfort and advice from a spiritualist. He told her that her loved ones’ lives had been taken by the restless spirits of the many men killed by the Winchester repeating rifle, “The Gun That Won The West.” The spirits would turn on her as well, he said, unless she moved west and built a home big enough to house all of them. He also told Sarah that she must never stop building and expanding the house. If work stopped, she would die. Sarah took the medium’s counsel literally, and to epic extremes. Migrating to California in 1884, she bought an eight-room farmhouse on what were then the outskirts of San Jose. There, she dedicated her $21 million inheritance and rifle-royalty payments to granting the spirits’ wishes. For the next 38 years, she and an army of artisans in her employ expanded, rebuilt and remodeled the house to hold the ghosts of Winchester rifle victims. The hammering and sawing never stopped at chez Winchester; Sarah’s immense wealth and total obsession made sure that a well-paid workmen were busy 24 hours a day, 365 days a year, Sundays and holidays included. Sitting in a secret, blue-walled séance room deep in the house’s interior, Mrs. Winchester held court with the spirits nightly, whose constant demands for more room guaranteed an ever-changing floor plan. She would summon the spirits to the séance room by ringing a bell in a nearby tower at midnight. The bell would be rung again at 2AM to dismiss the spirits who she would confer with on the next day’s building plans. Balconies, fireplaces, rooms, and whole wings sprouted up from nowhere like fungi. Barns were engulfed and observation towers blocked by the unplanned, uncontrolled growth. Mrs. Winchester made sure her busy staff got all the spirits’ latest instructions; a primitive intercom system linked by miles of copper wire sent messages around the huge, ever-expanding building. The house grew to immense proportions. 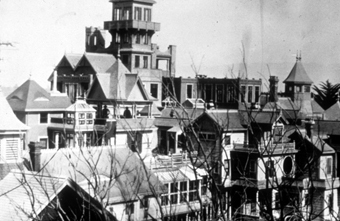 At the end of the four-decade construction binge, the Winchester House contained 160 rooms, 47 fireplaces, nine kitchens, 10,000 windows, and 2,000 doors. Sarah designed most of the features herself, and many of the additions and improvements reflected her own bizarre superstitions and fears, as well as the chaotic randomness of the building project. Doors opened onto dead-end hallways, blank walls, or three-story drops. Corridors tapered from normal width down to inches-wide crawlspaces. Stairways led nowhere, undulated like roller coasters, or compressed 42 steps into a nine-foot climb with two-inch-high rises. It was said that she installed these strange features to confuse and thwart the many evil spirits who arrived at the house courtesy of the Winchester ’73 rifle. A recurring motif throughout the house was the number 13. Believing that the number had powerful occult significance, Mrs. Winchester included it in such house fixtures as the 13-pane windows, the 13-paneled doors, 13-hole drains, 13-globe chandeliers, and 13-step stairways. Sarah roamed all over the massive house and never slept in the same bedroom more than one night at a time. After the 1906 earthquake struck San Jose, it took servants almost an hour to find her in the house’s recesses, trapped in a room by a blocked door. Terrified by the quake (she thought it was caused by the spirits), she moved temporarily onto a houseboat, but soon returned to her monstrous mansion. There she remained until her death in 1922 at the age of 85. It’s said that you can still see half-driven nails in some of the walls, marking where carpenters stopped work when they heard that Mrs. Winchester had joined her friends and foes in the spirit world. The house is a natural magnet for psychic investigators, and such famed occult detectives as legendary magician Harry Houdini have visited the house. Many seances have been held in the strange “blue room.” Mediums have seen unearthly lights bobbing along the endless halls and have felt the presence of Mrs. Winchester’s long-dead servants and workmen. Even Sarah herself has appeared posthumously in the earthquake-devastated Daisy bedroom and the ornate music room. As we waited for our Mansion Tour to begin, I decided to shoot a few pics of the place. I used my LCD screen to line up the shot, but the second I aimed the camera at the house, my LCD went wacky and I got the bizarre effect that you see on the top left pic. As soon as I panned the camera away from the house, the screen would clear up perfectly. Yet every time I aimed it at the house again, it started giving a static-like, almost negative effect. I called Liz over to verify what was happening, and she couldn't believe it either––she even took a pic of my camera's LCD screen for good measure, and we kept exchanging confused looks as we tried to figure out what was causing the camera's weird behavior. Once we entered the house for our tour of 160 of the mansion's rooms, the camera weirdness continued. We had three fully charged batteries between the two of us, yet we both started losing battery power as soon as we entered the house. I continued to snap pic after pic inside the house, but I kept getting completely blacked-out shots, or the strange, colored negative-like effect! I have never before or since seen my camera do anything remotely like this. It almost seemed like a serious camera problem, except for the fact that as you can see, I was getting some perfectly normal, good shots in between the weird ones. Liz was also having problems with her camera... many of her pics were blown-out (i.e: too much light) despite the shadowy interior, and her battery power was draining at an unnatural rate. Also, my camera's power kept switching off. We both felt goose-bumpy when our guide explained to us that when Sarah Winchester dwelled here, she did not allow any photographs to be taken of her. Perhaps she was hanging around during parts of our tour... letting us know that she was still the lady of this house. It took over an hour to make our way through all of the rooms, and without our guide, I feel sure that we would have gotten hopelessly lost. There are so many twists and turns, false passageways, and hidden doorways... it's unbelievable. We moved through the Blue Seance Room... the bedroom where Sarah Winchester died... and the Grand Ballroom where she used to "entertain" her ghostly guests at the stroke of midnight. We saw the bizarre stairway that lead literally into the ceiling, the bathrooms with windows in their doors, and the Daisy Room where Sarah was trapped during the earthquake that leveled the top 3 floors of the house, leaving only 4 floors standing. Sarah's Mystery House is filled with cryptic messages and meanings. The number 13 can be found hidden throughout the house... curtain rods have 13 rings, windows and ceiling panels have 13 panes, sink drains have 13 holes, and so on. The symbol of the daisy (which in it's perfect form has 13...yep- 13 petals) can also be seen everywhere––in rugs, chandeliers, windows, and walls. There are two very mysterious messages written in the stained glass windows that Sarah herself designed for the Ballroom... the left window reads, "Wide unclasp the tables of their thoughts," while the right says, "These same thoughts people this little world." Although the words are Shakespeare's, no one knows why these particular enigmatic phrases were chosen for the windows.